I’m a free range writer and artist from the UK. My work is diverse and has been seen and heard in digital media, on radio and television, online, in theatres and art galleries, at film festivals, and in print, throughout Britain and internationally. My work has been in group exhibitions and festivals in the UK, Hong Kong, China, the Netherlands, Poland, Estonia, Spain, Germany, Sweden, Denmark, Canada, Norway, Italy, the United States and Japan. 2005-2008 I spent quite a lot of time living and working in Japan and China. I’ve been back to Japan since then, but I’m still pining for the fjords and for HK. My inspiration comes from historical and contemporary folklore, traditional storytelling, and magical or esoteric practices of Britain, Europe and Asia. I have an equal interest in science and technology, particularly the social sciences and their processes. I’ve collaborated extensively with scientists. I sometimes use scientific and academic research methods earnestly, sometimes satirically and pataphysically. I also like creepy old mannequins, broken toys, silly costumes, museums, absurdity and making machines do things their manufacturers wouldn’t approve of. Read a 2011 interview with me by fellow writer and artist Iain Aitch here or one I did in 2014 here. I’ve been artist in residence for ArtSway, New Media Scotland, the ESRC Genomics Policy and Research Forum at the University of Edinburgh (2006-2007), and OCAT Shenzhen, among others. In 2004 I was awarded an Arts Council England / English Heritage Artist’s Fellowship. In 2006 I was commissioned to make the film Qingdao 58 Middle in China. I’m the author of two published novels (Their Heads Are Anonymous and Monkey Boys.) Uncanny Valley: Collected Short Stories was published in 2008. I was involved publicly as an editor (and behind the scenes as a board member and advisor) with the new fiction site Pulp.Net from its foundation in 2003 until it went on a hiatus at the end of 2009, which turned out to be a permanent one. I made my first film in 2000, with Joe Magee: Hypnomart for Channel 4 Television’s ‘Animate!’. I also regularly take part in readings, talks, lectures and participatory arts work with people from school age upwards, and I sometimes work to commission for blogs, newspapers, art magazines, public agencies or private companies. Recent (2016) examples include work for Metal and Southend Borough Council, an Italian design company and writing a regular column about art for Sluice magazine. I was an Associate Artist at ArtSway Gallery until their closure in 2012, having worked with them in various ways since 2002. My Wikipedia page. I’m on Twitter, Facebook and LinkedIn. I’m always, although very slowly, working on a new book. 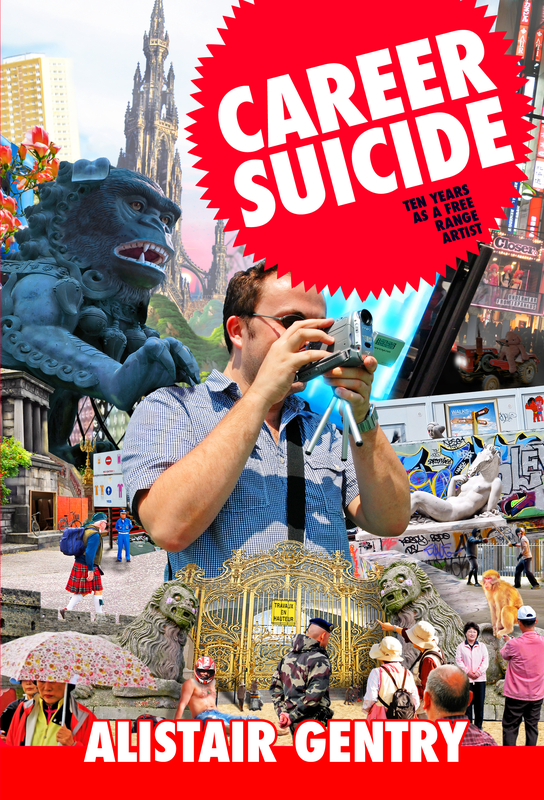 My non-fiction book Career Suicide is available as a print-on-demand book and a download. It’s about the reality of working in the art world for most artists, away from the glamorous and curatorially acclaimed end of the spectrum. Find out more about it and read an extract from the book here. My major project for 2009-2010 was Magickal Realism, a live video and performance project inspired by the Angelic Actions and writings of Queen Elizabeth I’s court wizard, John Dee. The first performance was at Colchester Arts Centre in late February, with subsequent showings in southern England and in Germany. In January and February 2011 I worked at KINO KINO Centre for Art & Film in Norway. For several years I ran a blog for random, non work-related writing: ADOXOBLOG. Career Suicide, although also resting at the moment, continues some of the themes I write about in the book of the same name, i.e. being an artist and the art world’s foibles, failings, fun and other things beginning with F.
a-n, Art Monthly, The Art Newspaper, BBC local radio, The Big Issue, Cabinet, Channel 4 Television (UK), China Daily, Dazed & Confused, The Evening Standard (London), The Face, Flux, Frieze, i-d (UK), IDN (Japan), The Guardian, Guardian Culture Pros, The Independent, The Independent on Sunday, LBC, Mac Format, MAP, Metro, QTV (China), Realtime (Australia), Resonance FM, The Sci-Fi Channel (UK), Scotland on Sunday, SFX, The Times (UK), Wired.